Roger Corben, the cyborg with the Kryptonite heart known as Metallo, has just been defeated by Superman. He was trying to steal solar mirrors from the rooftop of S.T.A.R. Laboratories in order to seek out a new power source for his robotic body. Superman takes one of the lead-backed mirrors to shield himself from the Kryptonite radiation. He uses his heat vision to weld it to Metallo's chest. With Metallo's lethal piece of Kal-El's homeworld covered, Superman knocks out Corben and delivers him to the authorities. Clark Kent and Lana Lang are reporting on Metallo's defeat on the WGBS Six O'Clock News. They also tell of tomorrow's opening of the Mount Olympus Correctional Facility, which will hold superhuman criminals and have special keys that use their various abilities against them to prevent escaping. The prison was designed and will be run by Carl Draper, a man who has been in love with Lana for quite some time. He apparently has known her for many years. WGBS News�Associate�Producer Martin H. Korda is speaking with Clark about his image while Lana is trying to mend fences�with�Lois Lane. She wants to have dinner tonight with the Daily Planet reporter in order to clear up any misunderstandings between them, but Lois has a date with Superman. Lois' method of responding makes Lana feel like Lois does not appreciate the Man of Steel, and the WGBS news anchorperson admits to herself that she loves Big Blue. It is opening day for the correctional facility. Lana is covering the event for WGBS News. She doesn't seem to remember Carl Draper, much to his�disappointment. Lana interviews him and takes a tour of the prison, but that all becomes overshadowed by Superman placing the penitentiary in a plastic bubble with an anti-gravity platform and launching it into the air to make it more difficult for the inmates to escape. Should the Man of Steel be needed, he has placed a signaling device in a jeweled pendant. Draper is to press the stone in it to call Superman. A sound only Kal-El's ears can pick up will alert him of trouble. That night, Larry Latimer, Draper's assistant, and Draper himself are watching the WGBS News. The interview with Draper had been cut to show more footage of Superman placing the prison in the sky. It looks as though the people of Metropolis have forgotten that Carl Draper had created the Mount Olympus Correctional Facility. It is late at night in the superhuman penitentiary. The prisoners are sound asleep as a mysterious figure in a gray costume and mask takes the keys to the cells of the Atomic Skull, the Parasite and Metallo. With those keys, this person will possess the powers and abilities of those three villains. Superman has just received a distress call from the Mount Olympus Correctional Facility. He speeds there to find Carl Draper on the floor. He says that he and Larry Latimer had a disagreement, and the assistant had hit him. Draper then tells the Man of Tomorrow that Latimer now intends to kidnap Lana Lang. Returning to Metropolis, Superman confronts the gray-costumed Latimer, who calls himself the Master Jailer, only to be�overwhelmed�by the super powers of three of his deadliest foes. The Master Jailer has just imprisoned both Lana Lang and Superman in�separate�cells deep within Mount Olympus. The Man of Steel cannot escape because the Jailer used the Parasite's energy draining abilities to weaken him. The gray garbed villain is also face to face with Lana and speaking to Superman through a radio/video unit while he reveals the truth to both of his prisoners. It was a robot of Carl Draper that had called for help. The Master Jailer is in reality the genuine article. He's placed Superman in a cell without his powers so that the Man of Steel cannot interfere with Draper's plans for the love of his life - Lana Lang. "Lockup at 20,000 Feet" may sound like something one wants to do to William Shatner after hearing him sing "Mister�Tambourine�Man" repeatedly on an�airplane�flight from Los Angeles, California to Paris, France, but it is a wonderful story that all the classic elements of the best Superman stories of the late 1970s. There's a lot of Superman battling the bad guys, in this case, Metallo and the Master Jailer, and we also have the Lois/Lana/Superman triangle. We all know how that turns out, but hey, it's still great to see. "Why did you give it a four out of five if you liked it so much?," you ask. Well, for me, the names of characters are important. They can make or break a character. 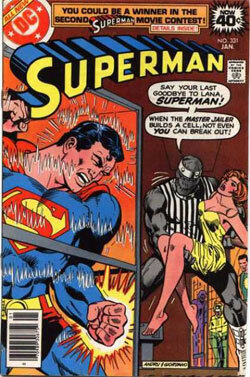 Unfortunately, the Master Jailer just sounds lame when you say something like, "Superman was beaten by the Master Jailer." At least, it seems idiotic to me. What were they thinking with that stupid name? Paste Pot Pete in the Marvel comic books, for example, had his name changed to the Trapster because Spider-Man had laughed at him. Let's hope the Master Jailer does the same in the future. Art - 5: What can I say that I haven't already said about the great Curt Swan? Many of the new artists could learn a thing or two from him. Nobody is better than Swan at visually telling a Superman story, and "Lockup at 20,000 Feet" proves this to the reader. Cover Art - 4: There's a little too much of a brown background for my taste, and the angles seem to be a bit off. Aside from that, it's a great image. It's dramatic and makes the viewer want to buy the comic book, but if the positioning of the elements had been slightly different, the cover would have been better.